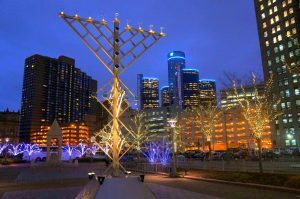 When Erik Nordin got a call from The Shul in West Bloomfield about creating an outdoor menorah that would rise 8 feet in the center of Downtown Detroit, he saw it as an interesting design challenge. The company he runs with his little brother Israel operates on custom orders, and this symbol of religious freedom would be a first. After more discussion with the rabbi’s wife, the scope of the project changed: The menorah would be around 24 feet high. And they had a month to complete the project. “They had a belief in it, a vision, and we were lucky enough to help in our way,” says Erik, 49. “Just dream big.” He and Israel are the founders of the Detroit Design Center, which is responsible for other iconic sculptures around the city. Israel Nordin, a “master builder,” according to his brother, worked 10-hour days for two weeks to ready the menorah for one of the first Menorah in the D candlelighting ceremonies some five years ago. The Art Deco marvel of steel, glass and copper will be raised this year on Dec. 27, in Cadillac Square (for more, see “Lighting Up The Motor City” on page 10). 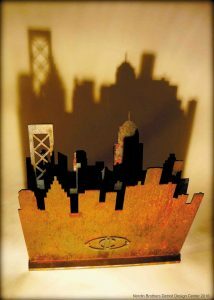 The Nordin brothers, who are not Jewish, typically work on large-scale commissions for cities, corporations, hospitals and individuals, but they also make smaller pieces in metal that are perfect as gifts, including a 3-inch-high replica of the Downtown Menorah on a leather lace, letter holders personalized by neighborhood, bookends, magazine racks and business-card holders. Prices range from $30 to $850. 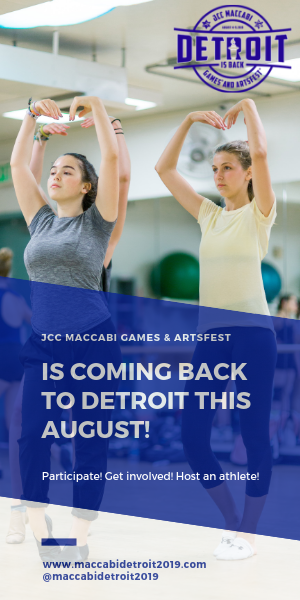 The pieces will be sold from the Detroit Design Center Gallery when it opens in the spring, but they are available for purchase now. The Nordins have been steadily working in the city for some 20 years. In 2000, the brothers opened the Detroit Design Center in a 12,000-square-foot Michigan Avenue factory that once housed their father’s steel company. It’s the nerve center of their operation, a place where creative and literal sparks fly. They work at one-of-a-kind sculptures, dining room and coffee tables, from wood, copper and glass, taking civic, residential and commercial commissions that average about $30,000 but have been as high as $100,000. They created a functioning saltwater aquarium of blown glass corals and sea grasses that sits in the Quicken Loans building, its animal inhabitants almost as pretty as their habitat. They’ve been doing trophies, one of which was commissioned for Wolverines coach Jim Harbaugh, who then commissioned the Nordins to make MVP plaques recognizing MVPs back to 1914 and beyond 1982. “That was another honor, to do the custom piece,” says Israel, 40. The brothers helped found the Detroit Design Festival and created the DBurst New Year’s “ball,” a 250-pound disc that has become part of the city’s own “ball drop” over the Chase Tower. They are working on signage for various neighborhoods. All of their work is invested with a shared passion for material and attention to detail. They collaborate closely, hashing over ideas that become better ones for solving a design. Their clients often agree with the refinements they make. The brothers are so close, they live on either side of an apartment building in Midtown, Erik with his wife, Mae, and young daughter, Norah; Israel with his wife, Amanda. The Nordins grew up in a Sterling Heights household filled with music, and each of the six kids were expected to learn an instrument and play a sport. Their mom, Elayne, was a painter before getting too busy with six children. Their father, Ron, was a musician. The family frequently visited the DIA, and Israel took a ceramics class at the College for Creative Studies (CCS) in the eighth grade. It seemed to his young eyes that the museum and school were the bright spots in a gloomy landscape. He graduated from CCS, Erik from the University of Michigan. In addition to the Detroit Design Center, the Nordins’ work is also featured at the Michigan Design Center in Troy. 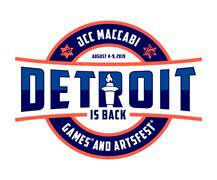 To purchase an item or learn more about their work, email Erik Nordin at detroitdesigncenter@gmail.com.